Join a tour of the restored mill with its Victorian milling machinery and watch the giant waterwheel turn as it is driven by water from the River Lym. A miller will demonstrate how the huge gears harness this power to drive the heavy grindstone. Watch the whole process over three floors as grain is converted into finely ground wholemeal flour: we mill Maris Widgeon wheat, spelt and rye which is available to buy in our shop. Displays chart the history of Lyme’s Town Mill, the history of milling in general, how the Town Mill was saved from redevelopment and the mill’s lifeblood, the River Lym. As part of the tour you will also be able to see how water from the Lym is helping with the environment by generating electricity through the Town Mill’s state of the art hydro-generating installation, and also browse the fascinating exhibition on the history of electricity in Lyme Regis. The Malthouse and The Courtyard Gallery both host regularly changing exhibitions of work in all media from local and South West artists. Feel free to browse around these exhibitions where you may feel inspired by, or want to buy, some of the work. The Town Mill is home to a variety of wonderful creative businesses where you can watch the artisans at work and perhaps buy a unique gift or souvenir: a jeweller, cafe, microbrewery, pottery, bakery/deli, design agency and vintage sewing sanctuary. We aim to offer miller-guided tours of our working watermill Monday to Sunday, between 11am and 4pm, subject to volunteer availability. In the Winter months we may be closed on certain days to carry out essential maintenance. Please call first if planning a special journey to avoid disappointment. 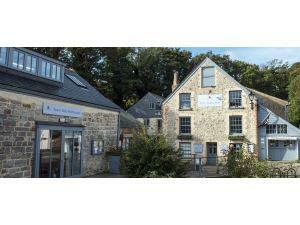 The Town Mill is owned and operated by a charitable trust and relies almost totally on its large band of volunteers. New volunteers are always welcome. Please visit our website or telephone for more information.